with Liliana Basarab (RO), Vesna Bukovec (SLO), Petra Feriancová (SK), Judit Fischer (HU), Philipp Fleischmann (A), Nilbar Güreş (TR/A), Marlene Haring (A), Nina Höchtl (A), Ana Hoffner (SRB/A), Käthe Ivansich (A), Gergely László (HU), Dorota Kenderová (SK), Johanna Kirsch (A), Eva Kot'átková (CZ), Gergely László (HU), Roberta Lima (BR/A), Marissa Lobo (BR/A), Olivia Mihaltianu (RO), Miklós Mécs (HU), Christoph Meier (A), Anna Molska (PL), Olivia Mihaltianu (RO), Ciprian Mureşan (RO), Jan Nálevka (CZ), Ioana Nemeş (RO), Timea Anita Oravecz (HU), Ekaterina Shapiro-Obermair (RU/A), Katarina Šević (SRB/HU), SZAF (Judit Fischer & Miklós Mécs), Adrien Tirtiaux (B/A), Jaro Varga (SK), Anna Witt (D/A) and others. Tuesday through Sunday: 10 a.m. –6 p.m.
Saturdays at 3 p.m. and Sundays at 11 a.m.
CASA da ESQUINA pelas 21:30h, uma conversa com a Dra Manuela Cruzeiro, o Dr. Rui Bebiano e Cátia Melo, organizada em colaboração com a República Marias do Loureiro e logo a seguir a exibição do filme Brick Lane de Sarah Gavron. Esperamos por vós! 18, sexta-feira, teremos mais uma conversa : Ser Feminista com Manuela Tavares (UMAR) e Graça Abranches. 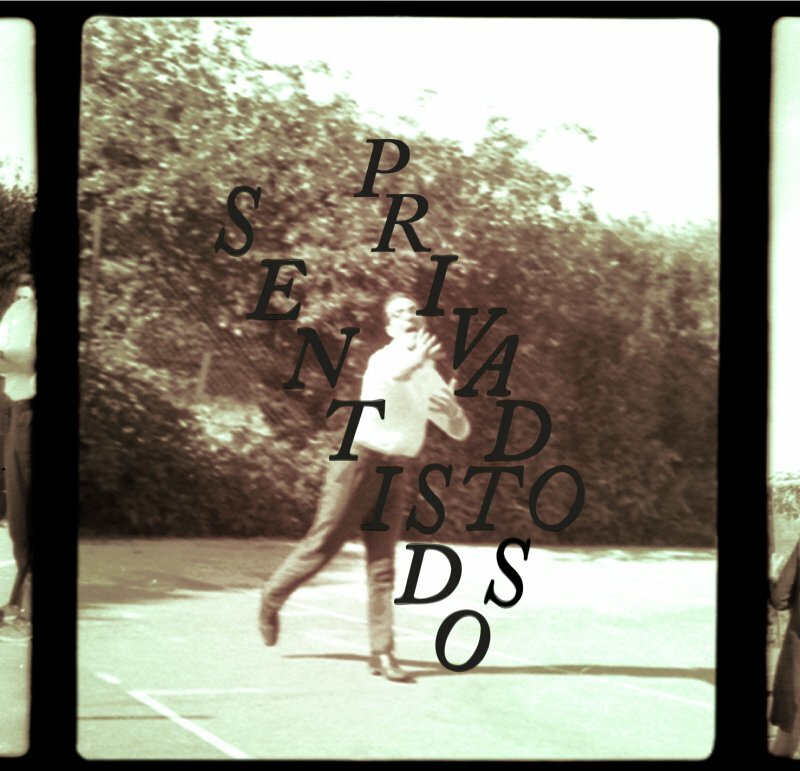 Seguem-se Maria Lado e Lucía Aldao em Muita poesia, Pouca diversão pelas 21:30h na Casa da Esquina e logo depois as Aranhiças presenteiam-nos com mais uma das suas performances poéticas. 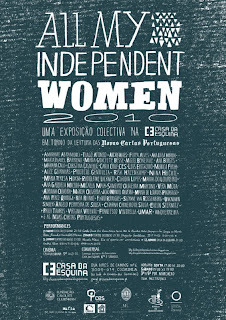 Como não podia deixar de ser, festejaremos em grande estes longos dias de trabalho e de orgulho que foi o projecto ALL MY INDEPENDENT WOMEN sem deitar a casa abaixo! Sentidos privados olham a condição do corpo e a sua reacção à aparente invisível percepção dos significados escondidos e revelados nas palavras proferidas. Recolhendo as palavras mais utilizadas nas Novas Cartas Portuguesas, corpo e prazer íntimo são tidos como ferramenta participada, cientes do gozo obtido nas possibilidades radicais da linguagem. BIO: André apaixona-se por distâncias que não lhe pertencem. Gosta de descrições de ausência, falhanço, excesso, melodrama e luto – recursos que definem o rumo dos seus projectos. Actualmente reside em Cincinnati, USA. "Power itself has become carnivalesque"
"Irony and grotesque no longer come from below, as popular release or political subversion, they now come from above. In a striking reversal, it is no longer the masses who identify with a hysterical leader (Hitler, Mussolini), but perverse leaders who identify with the masses (Berlusconi, Sarkozy) and with comparable results. Fragmented and disseminated throughout social networks, power itself has become carnivalesque." The lecture of Prof. Lotringer will be followed by a conversation hosted by researcher Steven Ten Thije. Sylvère Lotringer, founder of Semiotext(e), is widely credited for introducing "French Theory" in America. He is professor emeritus of French Philosophy at Columbia University, Jean Baudrillard professor at the European Graduate School, and visiting professor at SciArc in Los Angeles. 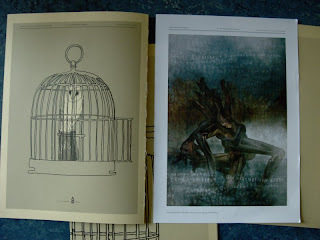 His most recent publications are Fous d'Artaud (Paris: Sens et Tonka, 2003) and Overexposed (New York: Semiotext(e), 2007). Steven Ten Thije is research curator at the Van Abbemuseum in Eindhoven and research fellow at the University of Hildesheim. He studied art history and philosophy at the University of Amsterdam. RSVP to bookings@ificantdance.org. Space is limited. 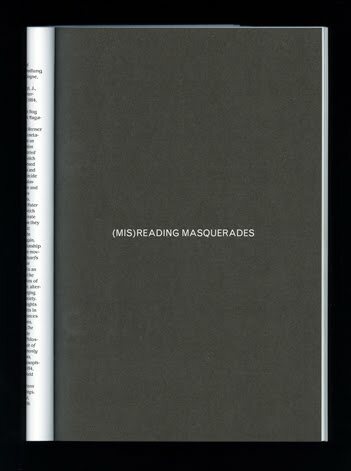 This publication focuses on the notion of Masquerade. For the past two years, If I Can't Dance, I Don't Want To Be Part Of Your Revolution has been exploring the cultural, social and political meanings of this concept from a critical and interdisciplinary perspective together with more than fifty artists, curators, writers and theoreticians. (Mis)reading Masquerades comprises a selection of theoretical texts drawn from different fields of knowledge that address questions such as transgression, gender identity and subversion, gesture, the carnivalesque, the construction of subjectivity, authorship, mimesis, and alterity. The publication features introductions to each text by the participants of our monthly reading group, newly commissioned essays by writers and curators from the field of contemporary art and contributions by artists from the Dutch Art Institute (Enschede) and Piet Zwart Institute (Rotterdam). '(Mis)reading Masquerades', 512 p., edited by Frédérique Bergholtz, Iberia Pérez. Produced by If I Can't Dance in collaboration with the Dutch Art Institute, the Piet Zwart Institute, and the Van Abbemuseum. 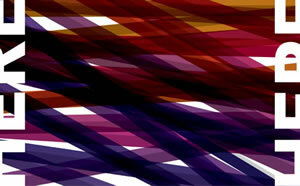 Design by Joris Kritis and Julie Peeters. Published by Revolver. ISBN 978-3-86895-071-7. EUR 35. 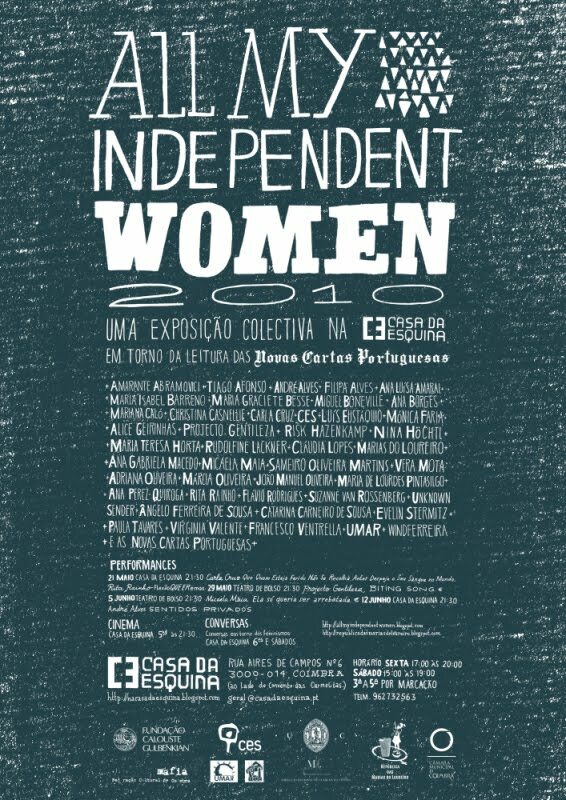 A Casa da Esquina promove no próximo sábado pelas 18h a conversa MULHERES E RESISTÊNCIA com Vanessa Almeida (investigadora), Shahd Wadi (investigadora), Margarida Viegas (República Rosa Luxemburgo) e Fátima Cavalho (Sindicato dos têxteis). 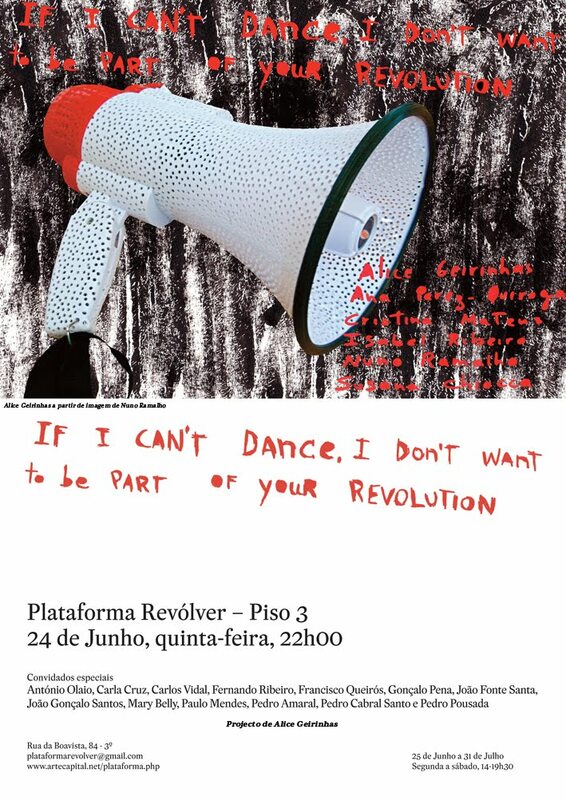 Já pelas 21:30, no Teatro de Bolso teremos a performance de Micaela Maia "Ela só queria ser arrebatada".